Visit our parent company Nu-Media Display Systems for more information and products. PCM Electronic Signs specializes in a wide range of Electronic LED Signs and peripherals. It can be as simple as pointing a wireless keypad and programming timely messages, or connecting to a PLC in the factory. We can connect to your PC or LAN network, using our easy to use software. If you are looking for indoor or outdoor displays, we have what you need. In standard or custom designs, we have an Electronic LED display to suit your needs. 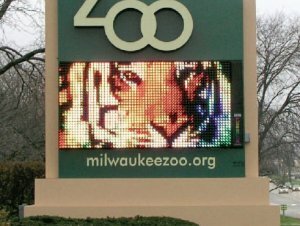 PCM carries 2 of the top lines of LED signs in the industry. Alpha LED Signs for indoors are easy to use, and come in a wide range of sizes. Starfire LED Displays are made for outdoors and factory applications. They come in standard and custom sizes. Custom software and special applications are a Starfire specialty.